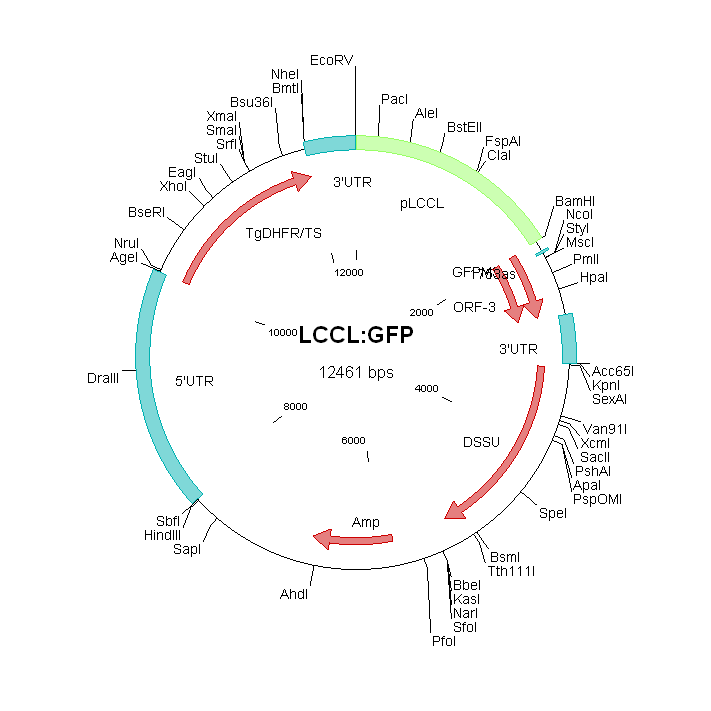 The mutant expresses GFP under the control of the promoter of the gene encoding LAP2 (LCCL/lectin adhesive-like protein 2; LCCL domain containing protein CCp1; PF14_0723). See also the phenotype description of mutants lacking expression of LAP2/CCp1 (RMgm-118, RMgm-121). The construct GFPcon (RMgm-5) containing GFP under the control of the eef1a promoter formed the basis for the construct driving expression of GFP under control of the ccp1/lap2 promoter. This constructs contains a c/d-ssurrna target fragment for integration into the c/d-rrna genomic locus. GFP is flanked by the 3'-UTR sequence of the dhfr gene of P. berghei. The eef1a promoter region is replaced by a 1986 bp fragment (EcoRV/BamHI) of the promoter region of ccp1/lap2. Additional remarks genetic modification The construct GFPcon (RMgm-5) containing GFP under the control of the eef1a promoter formed the basis for the construct driving expression of GFP under control of the ccp1/lap2 promoter. This constructs contains a c/d-ssurrna target fragment for integration into the c/d-rrna genomic locus. GFP is flanked by the 3'-UTR sequence of the dhfr gene of P. berghei. The eef1a promoter region is replaced by a 1986 bp fragment (EcoRV/BamHI) of the promoter region of ccp1/lap2.